For many years coffee was made by pouring boiling water straight onto crushed beans in the base of a cup. This was not ideal and in the 19th Century the French introduced the idea of filtering the coffee and the beans were placed in a muslin bag in the cup but they still formed a sediment and for many years different techniques were tested to eliminate this residue. Today, coffee mills are known as coffee grinders but they are fundamentally the same item. 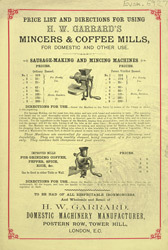 In the 19th Century there would have been many different designs of coffee mills some are featured in this advertisement.